New data coming in this morning and there has been a slight shift to the system for Monday/Tuesday. The NAM has come in more bullish with precipitation amounts BUT the amounts have shifted further north. That means that the band of "heavier" snow has shifted north towards the St. Louis area versus southeast Missouri/southern Illinois. Let's take a look at some of the snow accumulation maps generated by the NAM. First, a larger view. You can see a definite snow band setting up on the above image. It appears to parallel just north of I-44 through Missouri. Now a zoom in to the St. Louis area. This puts the heavier band of snow just north and northwest of the St. Louis metro area. 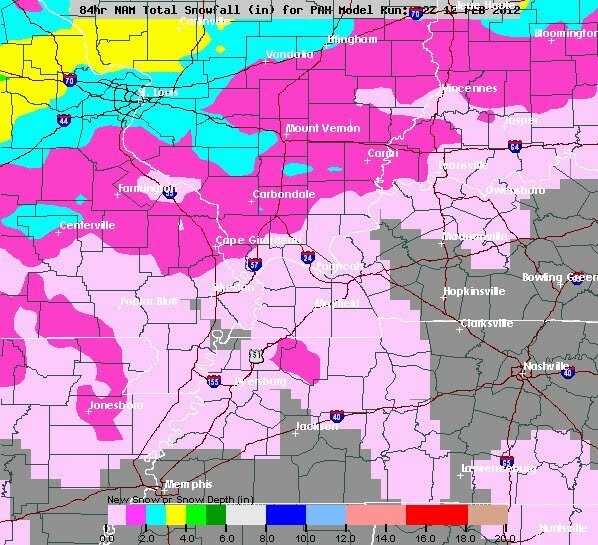 It also shows that some of the bigger snow totals could come from central Missouri towards Columbia and Jefferson City. 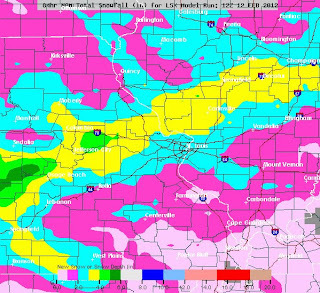 3"-5" looks like a good call for Columbia. Now down to the area centered around Paducah, Kentucky. Notice the lack of snow for western Kentucky and southeast Missouri. The model run has warmed things up a little bit more compared to earlier runs. The NAM is hinting at sleet or freezing rain moving through part of the area. Temperatures are going to be CRITICAL for the above area. Models are still suggesting temperatures will be straddling the freezing mark. This means that a minute shift in fine details could change things from rain, freezing rain, sleet and snow. Based off of this information places like Cape Girardeau see 0.5"-1.5" of snow. However, as I have discussed before, if things shift as little as 30 miles, the numbers could go up or could go down. Now a look at central Indiana. 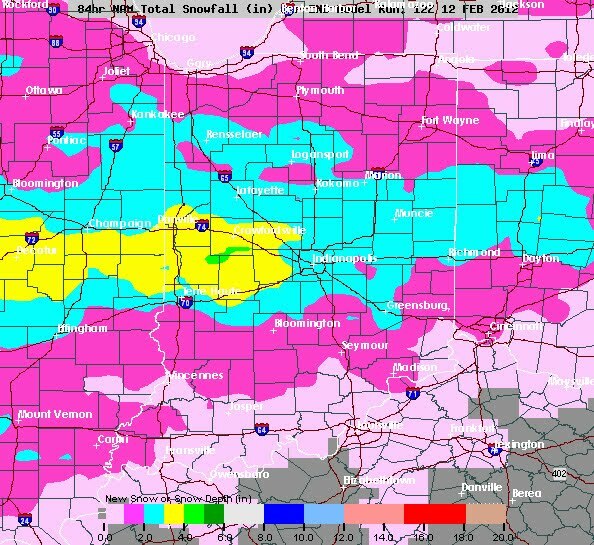 For the last couple of days models were a little bearish on precip amounts for central Indiana. This morning's NAM has come in a little bit higher with amounts. 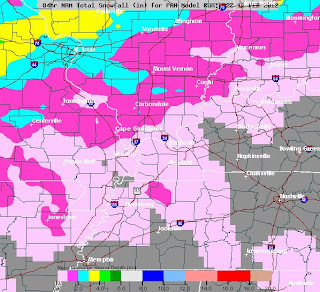 You can see how the band of snow moves across central Illinois and through the middle of Indiana. It puts down around 3" of snow for the Indianapolis International Airport (southwest side of city). It is looking like a 1"-3" is a good call for central Indiana. It is also looking like the precipitation will end as sleet. I'm waiting for the rest of NOAA's global forecast model to come in. Once it is all in and I have a chance to digest some of it, I'll post the information provided by the model.